Israeli supermarket magnate Rami Levy recently got involved in a new business – real estate. And not just any real estate; several days ago, Levy made a successful bid to take over development of the Nof Zion project, a new Jewish neighborhood in lands liberated by Israel in the 1967 Six Day War that was in danger of being purchased by an Arab businessman. Levy is a businessman – a successful one, judging by his accomplishments in the supermarket business. But he's a businessman with a “neshama" (soul). As he tells Israel National News TV, one of the reasons he gives such high discounts in his supermarkets is because “it helps some families 'finish the month' with their food budget, or even helps put meals on their Shabbat table.” Israeli salaries are paid once a month and "finishing the month" is an Israeli expression meaning staying within one's monthly budget. Levy is in business to make money, but he tries to do it by sticking to Jewish and Zionist values. It turned out to be a savvy move on Levy's part, as not only Jews from towns in Yesha, but Arabs living in PA towns shop at Levy's stores, giving him so much business that the PA has several times tried to force its subjects to boycott the chain – to no avail. “We sell to everyone, regardless of race, creed or color. This is a business, and I will continue to serve all those who wish to buy from me. I will also provide work for anyone who wishes to help serve those customers, as long as they are prepared to work and provide services in the spirit of mutual respect,” he says. Besides Shaar Binyamin, Levy's Yesha stores include branches in Gush Etzion, Mishor Adumim, and Beitar Ilit. Levy's “Jewish capitalism” extends to his business practices as well, including discounting, not only as a means of pulling customers into the store, but as a means of helping lower-income families stretch their food-shopping shekels. “I work hard to make sure that the total bill a family can expect to pay for their food costs is between 20% and 25% lower here than in other stores,” he says. As a result, the chain runs specials, especially around the holidays; last Rosh HaShanah, Rami Levy stores charged customers only one shekel per kilo for chicken, apples and honey! 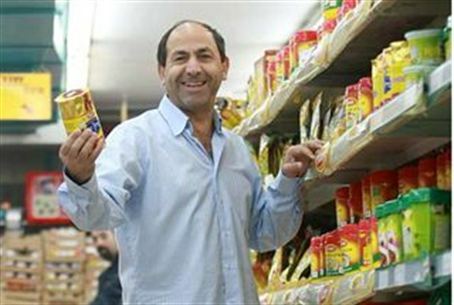 Levy has been in the grocery business since 1996, and today the chain has 21 branches, mostly in Jerusalem – but with branches in Haifa, Afula, Be'ersheva, and points in between, Rami Levy is quickly becoming a national phenomenon. Besides groceries and real estate, Levy has also dipped his toe into textiles, with his Yafiz clothing store chain – and the Rami Levy supermarkets are now big enough to support their own house brand, called, appropriately enough, “Hamotag” (“The Brand”).